A news editor in Santiago described this morning's earthquake as "pretty terrifying." Nathan Crooks, a journalist for Business News Americas, told CBS News he was asleep in Santiago when the quake hit, violently shaking his house. 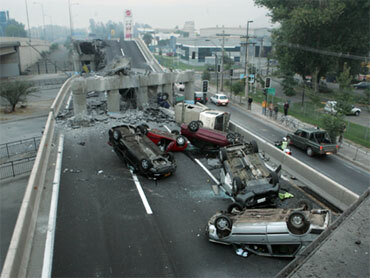 "We're used to earthquakes in Chile, and we get lots of tremors. You could tell that this one was different from the sound of it. It was really violent! I have never been in an earthquake this large. "You could hear the walls shaking, books dropping, dishes dropping, it was this general roar, almost like a freight train - everything combined, everywhere in the entire city." Crooks positioned himself under a doorframe. "I live in a new high rise built for earthquakes," he said. "It was interesting to see the building move with the quake. "Another thing was how LONG it went on. It went on for a loooong time," said Crooks. "That's what surprised me the most. It was violent shaking for what seemed like a couple of minutes." Crooks said electric power out was out. "I went downstairs to get a handle of what was going on, to make sure no structural damage to the building. There was no cell phone service. You could hear car alarms going off, sirens, a lot of general commotion." Public transport was stopped. He described the rubble he saw on a brief walk, and the fate of one of the most famous churches in Santiago. "Not too much damage, but the main church of Providencia in the old part of town, one of the top towers collapsed. It's very potent to see that image." Video: Chile in a "State of Catastrophe"